For the upcoming fermented foods class, hosted by your very own Lane County Master Food Preserver Alliance on April 13, 6-8:30, I’ll be demo-ing radish kimchi, among other things. Isn’t it beautiful? 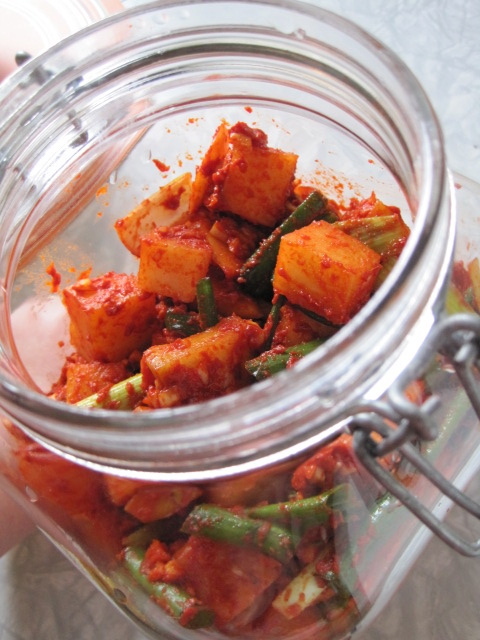 My favorite type of kimchi, when it’s good, is the radish cube kimchi left to ferment on the counter for a few days. The Koreans call it “kkak ttu gi” or “ggak du gi,” and when it is properly juicy and bubbly, it will have almost a fizzy, live quality when you bite into a cube. All that fermentation provides kim chi with all the health benefits of sauerkraut; the stuff is teeming with probiotics, vitamins A, B and C, iron and calcium. But that’s not why we eat it. We eat it because it’s delicious. In Eugene, there aren’t many Korean restaurants that serve cubed radish kimchi, but they’re pretty standard in the ban chan collection of kimchi and pickles you see in big city Korean restaurants. (They do sell radish kimchi at Sunrise Market, fyi.) But it’s much better when you can make it at home. All you need is a gallon or larger glass jar (the red pepper will stain plastic) and a trip to the local Korean market, where you will buy Korean red pepper (much milder than our ubiquitous chili flakes), a Korean radish (a.k.a. “moo”), tiny salted shrimp, garlic, ginger, and green onions. I used garlic chives from the farmer’s market, too. The Korean radishes vary in size, but most approximate an elongated cantaloupe, or a small football. If you can’t make it to the class — where I’ll be providing my recipe and tips and samples — and you’d like a step-by-step illustrated recipe, this is a good, simple one. Peel and cube the radish into 1-inch (no larger) pieces. Salt and let sit in bowl on counter for 1-2 hours. Drain the cubes and rinse in cold water. Prepare the kimchi souse. You can either make a paste in a food processor with the garlic, ginger, sugar and shrimp, or just finely mince everything and combine with the drained radish cubes. Mix well with your hands (you might want to use gloves if your hands are sensitive to spice), massaging spices into the cubes. Add a little bit of water to ensure everything is nice and pasty, and the souse covers the cubes. Add the sesame seeds and scallions and mix well. 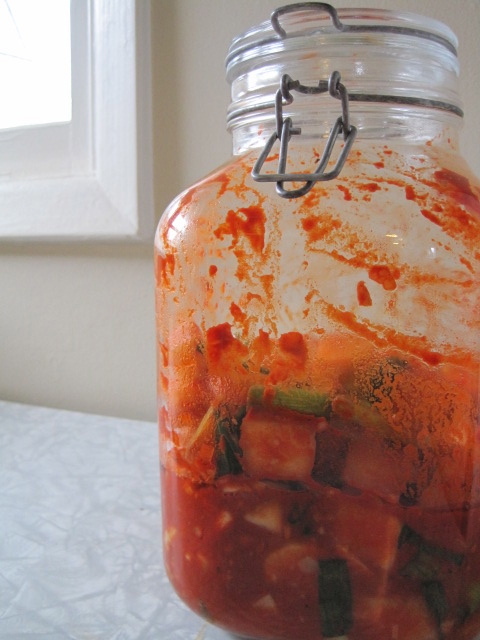 Place the kim chi in a gallon or larger-sized glass jar that has been thoroughly cleaned and sterilized. I use a 3L hinged jar without the rubber ring, so I can close the jar but not seal it. It helps to use a canning funnel to get the cubes into the jar — you’ll get red pepper paste everywhere. My radishes are tiny sprouts, but in the meantime I just bought 2 big heads of nappa cabbage to make into kimchi tomorrow with all the carrots I just dug up plus wild garlic. I love kimchi. Kimchi . . . breakfast of champions. So lovely! I’ve never seen a moo before…or maybe I have and didn’t realize it. I’ve done a radish kimchi with daikon. 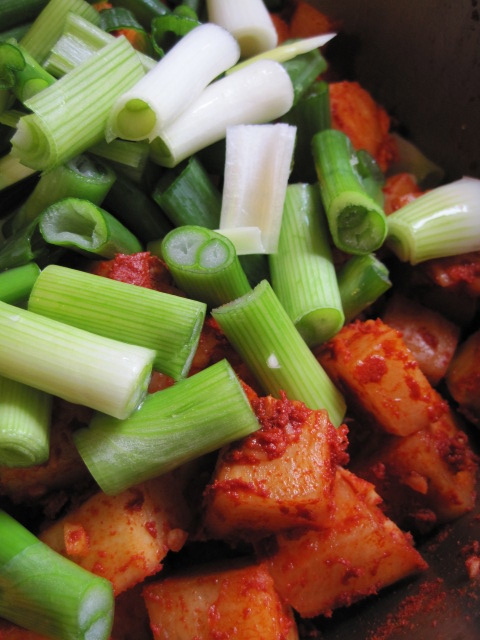 I love kimchi for breakfast! Thanks for citing my blog and promoting the recipe!